Meet the Sell OBX Team -Karen, Dru and Jeff. Karen DelVacchio, Dru Ferrence, and Jeff Ferrence collectively bring over 70 years of real estate experience to the Sell OBX Team and is one of the most productive, respected and experienced real estate teams on the Outer Banks of North Carolina. The three-person team consistently closes over 50 transactions every year. Service to clients is outstanding because there is always a team member available to work on behalf of their clients. Karen has been involved in real estate, as a professional real estate manager, and as an investment property owner, for more than 35 years. 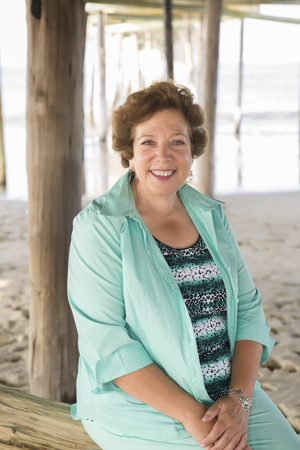 She and her husband purchased their first Outer Banks property more than 25 years ago. After she retired from a long career with a large insurance company in Philadelphia, they decided to make the Outer Banks and the Village at Nags Head their home. Karen has a B.S. in Business from St. Joseph’s University and MBA studies at Temple University. Additionally, she has many business accomplishments and professional designations. With her exceptional business and real estate background, and her strong commitment to excellence in servicing clients, Karen is well qualified to assist you with your sale or acquisition. Whether you are looking for a second home, investment property, a little getaway bungalow, golf course living or properties convenient to world-class fishing, Karen will be glad to help you find exactly what you are looking for. You owe it to yourself to make your real estate search more enjoyable and successful by allowing Karen to work for you.